Starting in summer 2018, new features on your SDG&E bill will make it easier to understand and manage your energy use. 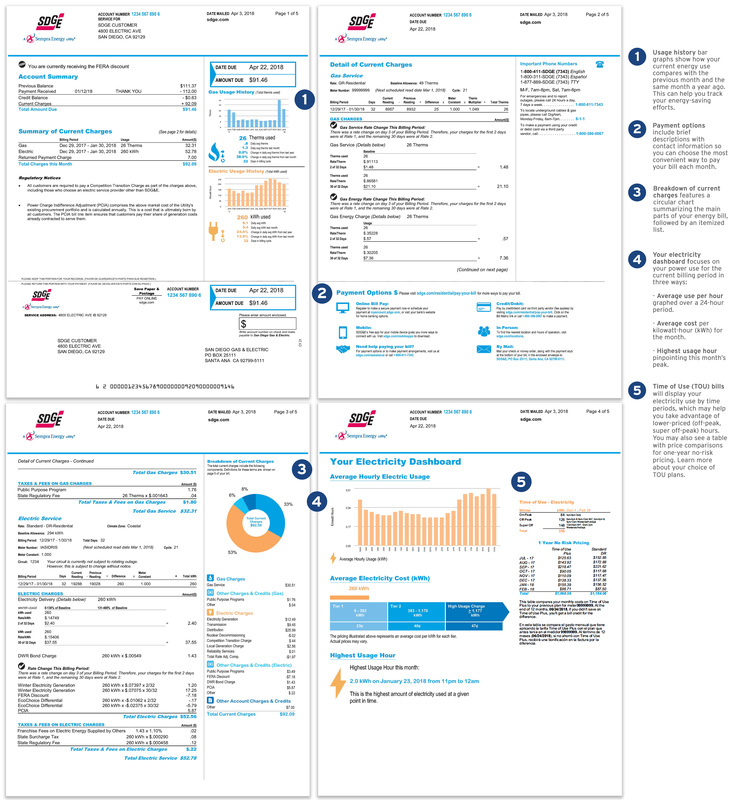 These improvements include your electricity dashboard, usage history and other information at a glance, as highlighted below and shown in the sample bills. Usage history bar graphs show how your current energy use compares with the previous month and the same month a year ago. This can help you track your energy-saving efforts. Payment options include brief descriptions with contact information so you can choose the most convenient way to pay your bill each month. Breakdown of current charges features a circular chart summarizing the main parts of your energy bill, followed by an itemized list. - Average use per hour graphed over a 24-hour period. - Average cost per kilowatt-hour (kWh) for the month. - Highest usage hour pinpointing this month’s peak. Time of Use (TOU) bills will display your electricity use by time periods, which may help you take advantage of lower-priced (off-peak, super off-peak) hours. You may also see a table with price comparisons for one-year no-risk pricing. Learn more about your choice of TOU plans. For details about the charges listed on your bill, look for the “Definitions” and “SDG&E Policies and Notices” sections at the end of each bill, or visit sdge.com/mybill.